Richmond Hill, ON (May 30, 2018) – The Canadian Junior Golf Association (CJGA) is set to conduct the second David Hearn Junior Series presented by Kia tournament this weekend at the beautiful Angus Glen Golf Club in Markham, Ontario. 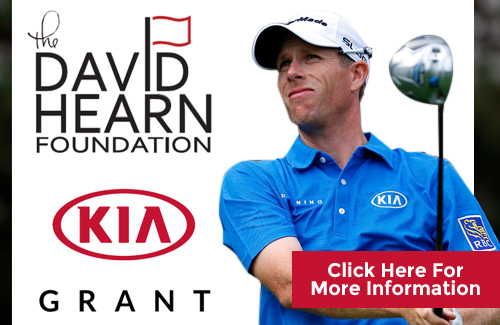 Each David Hearn Junior Series event presented by KIA event will qualify the champions of each age division with a spot in the David Hearn KIA Championship this September. The Championship event will feature a 36-hole competition as well as an exclusive golf clinic and Q&A for the juniors with PGA TOUR Golfer David Hearn himself. For the second consecutive year, the CJGA is partnering with Special Olympics Canada. Nine Special Olympic Athletes will be competing alongside the juniors in the 2-day qualifying event for the David Hearn KIA Championship. Likewise, the Special Olympic Athletes are tuning up for the Special Olympics Canada Sumer Games from July 31 – August 4 in Antigonish, Nova Scotia. In 2015, the south course re-opened after completing a $6 million renovation by award-winning golf architectural firm MacKenzie & Ebert who’ve advised on an impressive list of world-renowned courses such as Turnberry, Royal St. Georges, Royal Lytham & St. Annes, The Abaco Club, Royal Troon, Royal Liverpool, Goodwood and Carnegie Abbey. Special Olympics is a global grassroots movement, bringing community programs and competition opportunities to more than 4.5 million children, youth and adults with intellectual disabilities across 170 countries worldwide. In Canada, more than 45,087 children, youth and adults with an intellectual disability participate in programs run with the support of local sport clubs across 12 provincial and territorial Chapters. They are supported by an extraordinary network of more than 21,479 volunteers — Canadians who are committed to help accomplish something remarkable. Kia Canada Inc. (www.kia.ca – www.facebook.com/kiacanada) , a maker of quality vehicles for the young-at-heart is a subsidiary of Kia Motors Corporation (KMC) which was founded in 1999 and sells and services high quality, class leading vehicles like the Soul, Forte, Optima and Sorento through a network of 189 dealers nationwide. Kia Canada Inc. employs 154 people in its Mississauga, Ontario headquarters and four regional offices across Canada, including a state-of-the-art facility in Montreal. Kia’s brand slogan “The Power to Surprise” represents the company’s global commitment to surprise the world by providing exciting & inspiring experiences that go beyond expectations. Founded in 2015, The David Hearn Foundation’s central focus is to support the Alzheimer Society of Canada in reducing the personal and social impacts of the disease by raising funds to provide individuals and families with needed programs and services. Through its partnership, the Foundation will aim to increase awareness, improve care for those in need and enhance the quality of life for those affected by the disease, while also empowering Canadians to take action and create positive change. The Canadian Junior Golf Association (CJGA) is a “registered Canadian amateur athletic association” (RCAAA) non-for-profit registered federally with Revenue Canada. The CJGA is dedicated to providing Canada’s junior golfers with the necessary skills and knowledge required to lay a foundation for a future in competitive golf.